Orthokeratology, also known as ortho-k, is the correction of vision with overnight contact lenses that shape the front of the eye. With this treatment, vision correction is not required during the daytime if adequate treatment effect is achieved overnight. This is a popular treatment for younger individuals because it has actually been shown to slow the progression of nearsightedness. A correctly fit ortho-k lens showing an area of pressure upon the cornea centrally. Custom rigid contact lenses are fit for a patient with the intention of applying pressure to the front of the eye, the cornea. This allows for the correction of the patient's prescription because it reshapes the cornea as the lens is worn for several hours while sleeping. The cornea is the most important refractive surface in the eye, meaning that altering its shape greatly influences an individual's prescription. 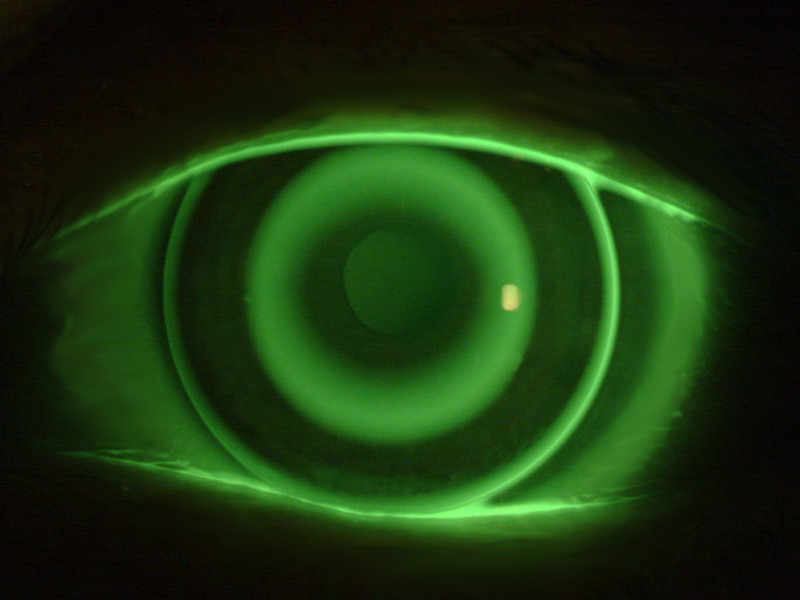 When the correct fit is achieved, the reshaped cornea will correct for the patient's prescription. Who is a Candidate for Orthokeratology? For the most part, younger individuals are the best candidates for ortho-k. Because the treatment requires a certain degree of reshaping before a full corrective effect is achieved, a full night of sleep is require each night. 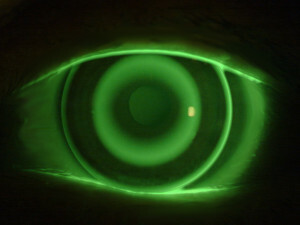 Orthokeratology is often times seen as an alternative to laser surgery because it allows a patient to be without glasses or contact lenses during the day time, but it is a temporary correction and does not have an age requirement, as long as the patient is mature enough to handle contact lens wear. Not all prescriptions can be corrected by orthokeratology. Generally, nearsighted individuals with a prescription of -4.00DS or less achieve the best results, though it has been shown to work for higher prescriptions as well. Astigmatism presents a problem because the shape of the front of the eye is not perfectly round, making it difficult for an ortho-k lens to sit properly throughout the night. Farsighted individuals generally do not do as well with this treatment. There have been studies showing evidence that orthokeratology slows the progression of myopia, otherwise known as nearsightedness. Because most of the changes in one's eyes happens in youth and adolescence, wearing the lenses during this time is the most effective time to control myopia. Although it does not permanently reverse nearsightedness that one already has, it can slow the process down so that it does not get worse. As with most types of treatment, starting ortho-k early achieves the best results. What are the Disadvantages to Orthokeratology? Although achieving independence of glasses and contacts during the daytime is the goal, vision after ortho-k treatment may not be as sharp as with conventional vision correction. Because of the nature of the treatment, sleeping for fewer hours may result in undercorrection of vision. It is also possible that vision deteriorates throughout the day as the cornea returns to its normal shape. Sleeping in contact lenses is always a risk, so good hygiene properly cleaning and maintaining a proper wear schedule is paramount in avoiding infections and corneal abrasions. Because fitting a proper lens is not always easy, many follow-ups may be needed. There are many benefits to orthokeratology. Come visit our doctors at Simply Optometry to see if the treatment is right for you!